The two major components of the current prosthetic “test” will be to determine how technically capable the arm is and how well it’s controlled by Matheny’s brain. 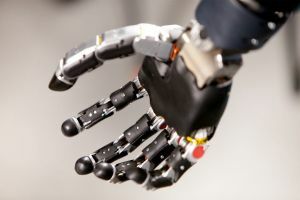 If these robotic limbs controlled solely by thought can be designed and successfully used, it would revolutionize prosthetics. Artificial limbs could then become much more organic; working with an individual patient’s movements, intentions, and body. If the year of testing proves successful, what could it mean for the future of prosthetics? Or for the prospect of cyborgs? Aside from the many ways in which it benefits patients using prosthetic limbs, the technology might also prove to be useful in some unexpected places — like a journey to Mars. Elon Musk has said that if humans are to keep up with machines, to explore the far reaches of our Solar System, to venture beyond what already know to be possible, we will likely need to merge with machines. Biologically, human beings have clear and strict limitations. But, if we were assisted or augmented by mind-controlled mechanical attachments, humans of the future could redefine those limits.